One of the more interesting devices announced at the Samsung Unpacked event was Samsung’s new Gear VR virtual reality headset. The headset, in combination with the Galaxy Note 4 (more about that later) provides a 360 degree, fully immersive virtual reality image. Samsung claims a “no lag” experience when the wearer moves his or her head, eliminating all motion blur, something which has been a problem with older VR technology. The hardware, powered by virtual reality technology developed by Oculus Technology (recently purchased by Google) features a “super accuracy” motion sensor similar to that in smart phones, but with 5 times the performance and accuracy according to Samsung and Oculus. The companies claim a motion to photon latency, from head motion to image motion, of less than 20 milliseconds. Like all other virtual reality headsets, the Gear VR uses two internal lenses to project slightly different images on each each eye, creating the illusion of depth and 3 dimensions. What makes the Gear VR unique, though, is that it contains no display at all. Instead, it uses a smartphone to provide the actual display technology. Specifically, it uses the Galaxy Note 4, and ONLY the galaxy Note 4. As shown in the image below, the front cover of the device can be removed, and the Note 4 inserted behind it. 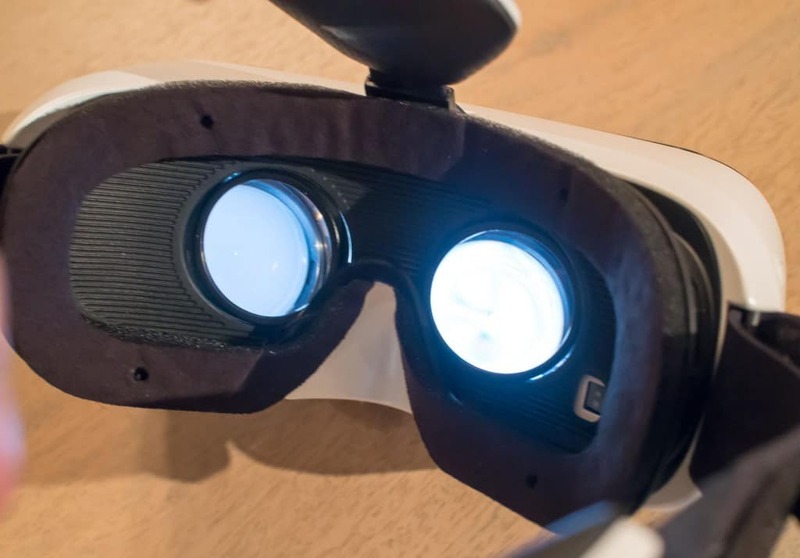 Samsung says the design provides a virtual 96 degree viewing angle, which means as you move your eyes from side to side you will continue to see a realistic virtual reality effect. According to Samsung and Oculus, the high resolution of the QuadHD SuperAmoled display, and the screen’s ability to switch individual pixels off and on extremely quickly is key to the quality of the VR experience and the elimination of motion blur. To ensure the VR experience isn’t ruined by lag when the smartphone is tasked to do other things, the Oculus hardware and software have been provided with direct kernel level drivers and a preemptive system priority. The kernel level drivers bypass the multiple layers of OS code and processes, providing faster screen redraws, and VR threads have complete priority over all other apps, preventing those apps from interrupting your VR experience. So no text messages suddenly appearing in the middle of your virtual world. 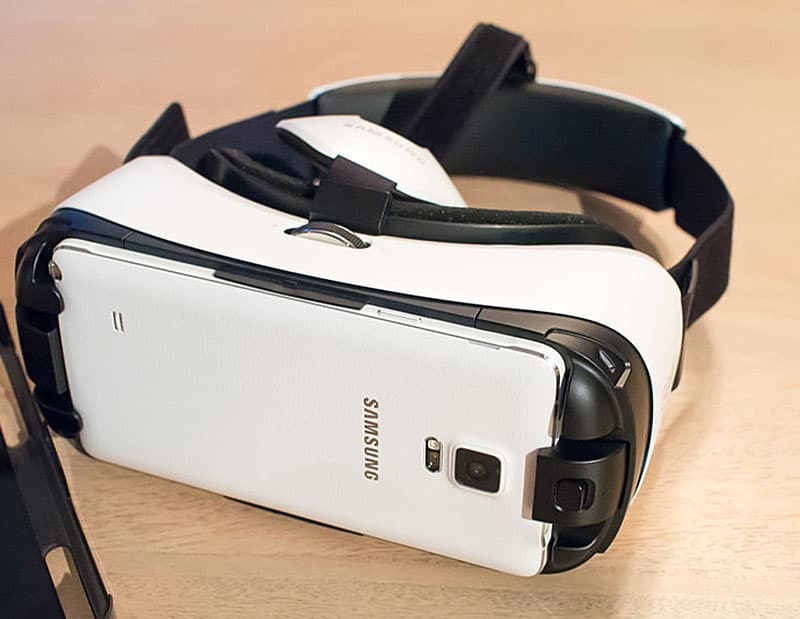 The Gear VR’s reliance on the Note 4 is an interesting approach. On the one hand, you’re not paying for display technology in the VR unit itself. On the other hand, Samsung has cleverly enticed you to buy two devices from them, and kept you from buying a competitor’s phone. Based on reports from IFA attendees, the technology may not be quite ready for prime time. Even with QuadHD resolution, putting a screen inches from your face and viewing it through lenses that magnify it still more apparently results in visible pixels. We’ll have to wait for more detailed evaluations to get a better feel. The hardware, though, has little value without 360 degree source material. The key questions are what source material will be available, and how soon? Samsung says it is investing in content development, and working with multiple big name partners to develop 360 degree VR content. The device ships with a micro SD card with sample material, but the Gear VR’s success will depend on what 3rd party developers provide. But this could be the future of interactive gaming, even if that has to wait for the next generation of true 4K screens.